Full tuition means that you are paying in advance for one class/week that meets on the same day and time for the designated weeks of the session. Since you have pre-paid for your class, you are entitled to make up any missed classes in another class on our schedule. The make-up class does not have to be the same style class as the class that was missed but must be at an appropriate experience level. All classes must be made up in the same session that they were missed. Ask a Danceworks staff or faculty member about the best make-up class for you. 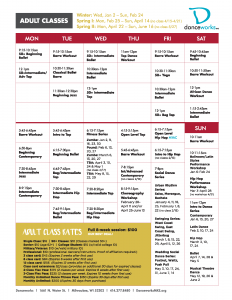 Please Note: Adult class sessions for Fall I – Spring II are usually 8 week sessions, and Summer is typically 10 weeks. If a class does not meet for all weeks of a session, students who register for the full session cost are welcome to either make up the class(es) with another class of their choosing that is appropriate for their experience level, or have the full session tuition price prorated. Please see the front desk or call 414.277.8480 ext. 6007 with any questions. Payment Plan: Half of the total full tuition is due by the first day of class, and the remaining balance will be due by the fourth week of class. A payment plan agreement must be completed and signed prior to the first class. Individual concerns or situations can be directed to Jolie Collins, Registrar, at 414.277.8480 x6007. Parent Discount: If you have a child enrolled in a Danceworks class, you’ll receive 20% off a class for yourself. The discount will be taken off the full tuition for a session. Single classes, class cards and flex passes cannot be discounted. Cannot be combined with any other offers or discounts. For more information, contact Amy Brinkman-Sustache, Director of Education, at 414.277.8480 x6002. Danceworks offers a variety of wedding packages to suit your every need. Our dance fitness classes, private dance instruction and custom choreography will give you the confidence and grace you want to portray on your wedding day, and every day! Private lessons are the best way to prepare you for an upcoming audition or special event, or to give you a boost of confidence on the dance floor. Single private lessons in a wide range of dance styles and levels are $70 per hour. Private class packages are also available.